Although eggplant is often referred to as a vegetable, it is actually a fruit. A member of the nightshade family, the eggplant is closely related to the potato and the tomato. The eggplant is part of a number of culinary traditions. It is used all over the world, from Thailand to Lebanon. 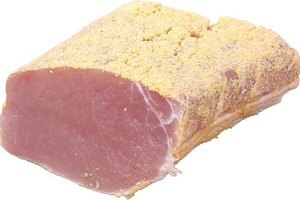 It is especially popular in Italian, Indian, Greek, French, Chinese and Middle-Eastern cuisines. Most eggplants have skin that is deep purple in color, although some varieties may have striped, pale purple or white flesh. The interior of eggplants is generally white or cream-colored, and it also contains seeds. Globe eggplants are large, dark and shaped like tear drops, while Italian and Asian eggplant varieties are long, slender and thin-skinned. White eggplants are quite small, but their skins tend to be tough. An eggplant's flavor is largely dependent upon how it is cooked and how it is flavored. 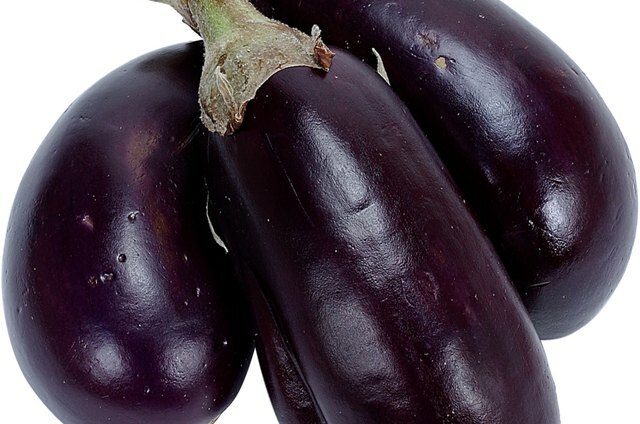 As discussed in Section 3, "Eggplant Texture," eggplant is a very thirsty ingredient, prone to sucking up flavor and moisture from the rest of the dish. As a result, eggplant can taste bland, overly rich or overly salty if it is not carefully handled. In addition, improperly treated eggplant can be somewhat bitter, which is because of its seeds. In modern eggplant breeds, this tendency toward bitterness has mostly been eliminated, but large eggplants and eggplant breeds that have not been genetically engineered to remove this trait can still carry this attribute. 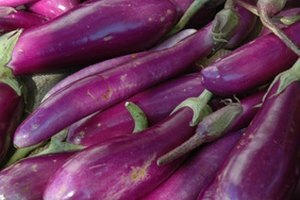 In general, smaller and thinner eggplants have a milder flavor than larger eggplants. This is especially notable in the Asian and Italian eggplant varieties, which are far more delicate in taste than globe eggplants. However, when cooked with olive oil, globe eggplant can taste satisfyingly rich and meaty. When grilled or roasted, eggplant can have a surprising depth of flavor, and it generally makes a piquant addition to any dish. Even after its bitterness has been removed, eggplant can be difficult to prepare properly because of its sponge-like texture. Eggplant flesh absorbs liquid and oil almost too easily, which can result in it taking on a greasy texture. However, when cooked correctly, eggplant's weaknesses can become strengths. Its ability to soak up sauces and flavorings make eggplant an incredibly versatile ingredient. Eggplant's sponge-like tendencies can also be curbed through the salting and pressing techniques described in Section 4, "Eggplant Treatment Methods." Well-cooked eggplant can range in texture from silky and luxuriant to crisp and firm. Grilling, roasting, pickling and breading are the cooking techniques best suited to combating eggplant's unique textural tendencies. To combat eggplant's tendency toward bitterness and sponginess, either press it, salt it or both. These techniques act to flatten the eggplant, reducing its absorbent abilities and leaching its bitterness. 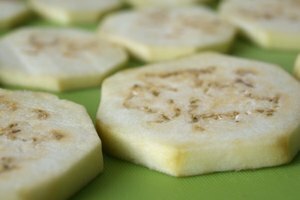 To salt eggplant, partially peel and cut it into slices, then toss with salt and let it drain. If you are pressing it, layer between paper towels, then weight it down for about an hour. 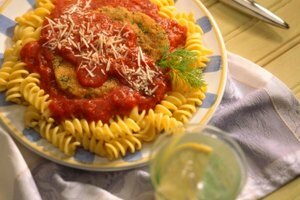 Classic eggplant dishes include moussaka, baba ghanoush, Imam bayildi, eggplant Parmesan, Baigan Bhartha, caponata and ratatouille. Eggplant is often integrated into curries, stir-fries, relishes, casseroles, sauces, soups and dips. Grilled eggplant is often enjoyed as an appetizer or used to compose sandwiches and salads, while breaded or battered eggplant is a common finger food. In some cuisines, eggplant is also pickled. Eggplant can also be baked, stuffed, smoked, broiled, fried or roasted. The scientific name for the eggplant is Solanum melongena. It is referred to as an aubergine in France and most of Europe, while in India it can be called a brinjal. In Italy it is called a melanzana; in Africa it is called a garden egg, and in Australia it is known as an eggfruit.